Greetings, fellow travelers! The Weekend Wizard Inn is open for business, so grab a seat and discuss what’s in your gaming quest log for the next few days. Maybe even do so over a piping bowl of ogre blood stew, a roasted giant’s toe, or a cool mug of our freshest snail ale! There’s a great spot over near the fire with some of your fellow mages, and it appears a purple-robed fella with a… creepy smile of sorts… is waving you over! Welcome, folks! I’m the Purple Prose Mage, and I’ll be holding the bar this week. The regular guy has a case of bad humours, so he’s with the local witch doctor – or Jeff, as I’ve always known him. If you creep upstairs, you might even be able to hear him moaning, but that’s a good sign. It means the power of Christ is compelling him. Anyway. Here are the games I’ll be playing this weekend. In case you didn’t know already, I have limited taste. This is a daily for me. I like having a game requiring little concentration to be playing on autopilot while I listen to podcasts, so it’s the game I’m playing on the most regular basis. It’s quite therapeutic and is a good way to enjoy at least one game every day without it eating too much into my time. I spend whole weekends playing this about once every month. See, I follow the real FIA World Rally Championship and this year started writing about it after every monthly weekend event. In the same way, I like to follow those events in the game (where possible), and this weekend coincides with 2019’s Rally Sweden, so that’s where I’m headed in the game. Some would say I’m quite a dedicated player, others would call me obsessed. When I get time, I spend the days leading up to the events experimenting with different car setups in order to get the best possible overall time during the championship mode, when I only get one shot. My intricately scrawled notes have not gone unnoticed by others. Call it a hobby. As featured earlier this week in The Well-Wed Mages’ Yearly Beloved, when I chose Blair Wainwright to be my waifu in a section described as “really depressing” and which I still stand by. Initially, I dipped back into it in order to research the character but found myself getting addicted all over again. I might start blogging about it more regularly, I dunno. 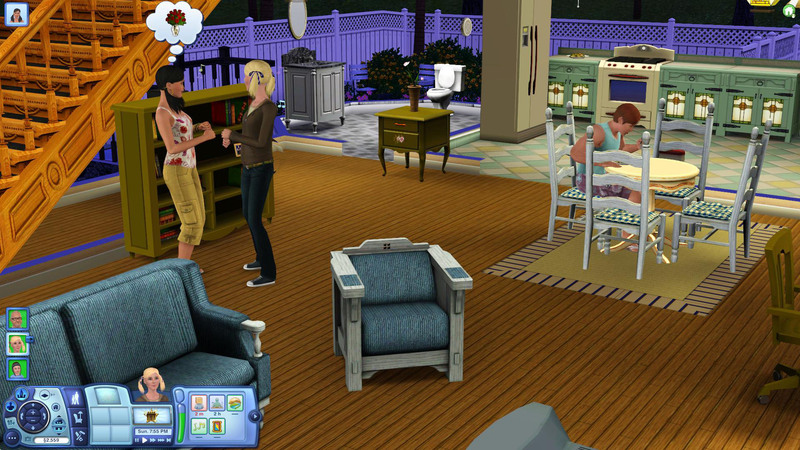 But basically, what’s happening is, my avatar married Blair and they moved into a small house. Now, they have six children, a very large extension and complete chaos. They may have both achieved their lifetime wishes and retired, but… well, you can imagine. Right now, I’m focusing on their eldest child, Brown Wainwright. He’s a workaholic genius who’s mastering many skills and painting many masterpieces. He also loves the outdoors, so he’s living on the edge of the property at the end of the garden, away from the screaming babies, flooding kitchens and decaying leftovers. As soon as he’s old enough to move out, you can bet he’s going to as soon as possible. But right now, his entire life is ahead of him, I’ve set the lifespan to epic length, and literally anything can happen. If only it could inspire me to think the same way about my own life. It takes a lot of gameplay time to truly appreciate this game, and even when you discover its nature, it’s something you still can’t quite articulate. The Purple Prose Mage is the author of the Racing Game of the Week column and is currently working on a documentary about the Driver series for its 20th anniversary on 25th June. He also likes reviewing the latest book he’s read and filing monthly rally reports on his own blog at alexsigsworth.wordpress.com. Thanks for taking over this weekend! I caught a nasty cold, but I’ve been using that downtime to make a serious dent in Tales of Zestiria on PS4. Almost done! Some serious rally action there! I’ll probably be going with XCOM and Kingdom Hearts 3 (which I’m playing because I’m playing it, not because I’m especially enjoying it which is a shame). My wife got my Soul Calibur 6 so I might pop that in, or maybe I’ll try out Crackdown 3 on Game Pass if I get some time.